1. Heat the butter in a pan and fry the carrot and beans for 3-4 minutes. Divide between 2 sheets baking paper or foil. 2. Place fish on top, season with a little black pepper. Add potatoes and drizzle with lemon juice. 3. Fold paper or foil and seal edges. 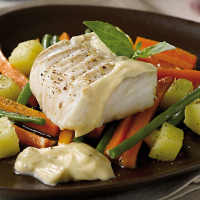 Bake in preheated oven 200°C, 180°C Fan, Gas mark 6 for 12-15 mins until fish is cooked. Serve with the Maille Aïoli.